The Mars Science Laboratory (MSL) team in the MSL Mission Support Area reacts after learning the the Curiosity rover has landed safely on Mars and images start coming in at the Jet Propulsion Laboratory on Mars, Sunday, Aug. 5, 2012 in Pasadena, Calif.
High School student Clara Ma spoke on NASA TV about her prize-winning 2009 essay to name the rover. "'Curiosity' was the first thing that popped into my head," Ma said of her inspiration for the name. "It's really human nature to always wonder what's out there. This experience has been absolutely life-changing." Peter Theisinger, Curiosity project manager, compares the size of Curiosity's huge wheels to those of the previous rovers sent to Mars, Spirit and Opportunity (medium-size) and Sojourner (smallest). Mission managers at NASA's Jet Propulsion Laboratory in Pasadena, Calif., share jars of peanuts during the countdown toward landing. According to laboratory lore, six Ranger moon missions failed to achieve their goals until one mission manager brought a jar of peanuts to his shift managing Ranger 7, which finally succeeded. Since then, peanuts are always present during critical moments, scientists said. In the moments before a signal arrived communicating the successful landing, scientists at JPL paced tensely and looked on with baited breath as readings came through from Curiosity. Because of the time it takes signals to travel from Mars to Earth, mission managers didn't learn the rover had landed until about 14 minutes after landing occurred. 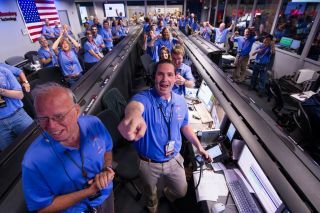 The moment of truth came at 10:32 p.m. PDT (1:32 a.m. EDT on Monday), when the signal came that Curiosity had landed safely on Mars. The dozens of gathered scientists at JPL exclaimed, clapped, cried and hugged each other to celebrate the feat. Just minutes after the signal came that Curiosity had landed safely, the rover sent back its first photos from the Martian surface. These pictures, tiny and grainy at first, were nonetheless received with cheers of joy throughout Mission Control. After the landing, JPL mission managers officially marked the handover from the mission's cruise team to its surface team. The cruise team had started a tradition of placing a marble into a jar for each successful day of the rover's journey toward Mars. Now, the surface team will continue the practice by starting the count over, placing a marble in a new jar for each day of Curiosity's surface activities.